The Blind Spot Monitoring (BSM) system is designed to assist the driver by monitoring blind spots on both sides of the vehicle to the rear in certain situations such as when changing lanes on roads and freeways. The BSM system monitors the detection areas on both sides of the vehicle to the rear when the vehicle speed is about 32 km/h (20 mph) or more, and notifies the driver of vehicles in the detection area by illuminating the BSM warning light. If the turn signal lever is operated in the direction the BSM warning light is illuminated, the system warns the driver of the vehicle in the detection area with a beep sound. A system malfunction or operation conditions are indicated by a warning. Refer to Warning/Indicator Lights 5.Refer to Blind Spot Monitoring (BSM) System Warning Beep 4. The BSM system can assist the driver in confirming the safety of the surroundings but is not a complete substitute. The driver is responsible for assuring lane changes and other maneuvers. Always pay attention to the direction in which the vehicle is traveling and the vehicle's surroundings. • The BSM system does not operate when the vehicle speed is lower than about 32 km/h (20 mph). • The radar sensors are equipped inside the rear bumper. • The system may not operate normally when towing a trailer. Turn off the system by operating the BSM OFF switch when towing a trailer. • Ice, snow, or soil adheres to the rear bumper surface around the radar sensors. • During adverse weather conditions such as rain or snow, or under conditions where water is sprayed. • The rear bumper area around the radar sensors is blocked by foreign material (such as stickers or a bicycle carrier). • Motorcycles • Vehicles with body shapes that radar may not reflect such as a flatbed trailer with no cargo. • Vehicles with lower body height such as sports cars. • Have the radar sensors inspected at an Authorized Mazda Dealer if any shock is applied to the rear bumper, even in a minor accident. If the vehicle is driven with a damaged radar sensor, the system may not operate properly resulting in an accident. 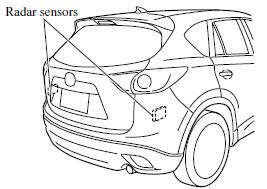 • For repairs or paintwork around the radar sensors, or replacement of the bumper, consult an Authorized Mazda Dealer. • The radar sensors of the BSM system may be regulated under the radio wave related laws of the country where the vehicle is driven. The sensors in this system are approved for use in the U.S.A.
(including territories), Canada, and Mexico. If a vehicle with a BSM system is driven in a country other than the U.S.A., Canada, or Mexico, the system has to be turned off using the BSM OFF switch. 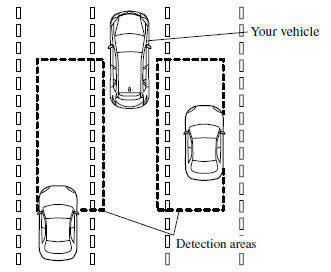 • The detection area of the system has been determined based on the lane width of general freeways. Therefore on a road with a narrower lane width, the system may detect vehicles on a lane next to the adjacent lane and operate the warning light/beep. On a road with wider lane width, the system may not detect vehicles on the adjacent lane and may not operate the warning light/beep. • The vehicle accelerates from a standing-start with a vehicle alongside. • A vehicle moves from a lane two lanes over to the adjacent lane. • The difference in vehicle speed between your vehicle and another vehicle is larger when passing or being passed, and the vehicle passes the detection area within a short period of time. • On a steep incline, or when there is a difference in height between lanes. • Immediately after the system has been activated by pressing the BSM OFF switch again after it has been turned off (BSM OFF indicator light in instrument panel illuminates) by pressing the switch. • Although the system may detect objects on the road side such as parked vehicles or guardrails and operate the warning light/beep, it does not indicate a malfunction. • If the vehicle is driven on a road with less traffic and few vehicles that the radar sensors can detect, the system may pause (The BSM OFF indicator light in the instrument panel flashes). However, it does not indicate a malfunction. • Ice or snow adheres to the surface of the outside mirrors. • The door window glass is tinted. The blind spot monitoring system alerts the driver to the presence of another vehicle in an adjacent lane using the BSM warning lights and the warning beep while the system is operational. Equipped on the left and right door mirrors. If the BSM system detects a vehicle in the detection area while the vehicle is driven at a speed of about 32 km/h (20 mph) or more, the BSM warning light illuminates on the side of the vehicle where the rear on-coming vehicle is detected. • If ice or snow adhere to the outer mirror surface, the BSM warning light may not be visible. • If the door window glass is tinted, it may affect the visibility of the BSM warning light, making it difficult to confirm the illumination of the light. When the BSM OFF switch is pressed, the BSM system turns off and the BSM OFF indicator light illuminates. Press the BSM OFF switch again to turn on the BSM system. The BSM OFF indicator light turns off. • If the ignition is switched off with the BSM system turned off, the system becomes operable automatically when the ignition is switched ON. The radar sensors are equipped inside the rear bumper. Always keep the bumper surface near the radar sensor area clean so that the BSM system operates normally. Refer to Exterior Care 5. • The BSM OFF indicator light flashes if the radar sensors cannot operate normally. If the light remains flashing after cleaning the bumper surface near the radar sensor area, consult an Authorized Mazda Dealer.